In the five years since the last Edguy album, 2014's Space Police - Defenders of the Crown, we've had not one but two new Avantasia full-lengths, suggesting that the side project is becoming the main project. Which isn't a bad thing; although I'm a fan of both bands 2016's Ghostlights was a far better album than Space Police, and it's not hard to think that Tobias Sammet's main group could do with taking itself a little more seriously. No-one would accuse Avantasia of frivolity with its legion of guest vocalists and complex touring schedules, and you'd be forgiven for thinking that it can sometimes seem like Sammet pours a little too much into Avantasia in recent years compared to Edguy. Still, when the results are this good it's hard to complain, and although it's something of a step backwards from the varied and fun Ghostlights, Moonglow is still very much worth hearing for fans of the project. 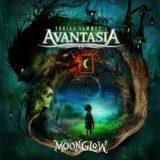 A concept album, Moonglow sticks far closer to the sort of theatrical rock or power metal that you'd expect, with none of the gothic or eastern experimentation of before. This was initially disappointing as none of the songs particularly stood out on the first listen, but given time Moonglow grows on you. The album immediately throws you in the deep end with the nine-minute opener Ghost in the Moon, a piano-backed rocker (with lyrical references to the previous album's Mystery of a Blood Red Rose) completely without guest vocalists except a backing chorus, letting Sammet's admittedly great singing take the lead as the song builds into something distinctly grandiose and almost Meatloaf-y. After a great guitar solo leads to a false ending, we're treated to a little orchestral interlude, another choral-backed chorus adding to the musical feeling and bringing everything back home; this is hardly my favourite genre of metal, but Sammet is so good at writing music like this that it's hard to dislike. That likeability continues through the album, the following Book of Shallows having a bit more power metal energy to it as Pretty Maids' Ronnie Atkins, Jørn Lande, and Blind Guardian's Hansi Kürsch take guest spots, the three co-dwelling well even before Kreator's Mille Petrozza pops up for a thrashy rant. My favourite of the four will always be the unmistakeable Kürsch who returns a little later with Lande on the eleven-minute epic The Raven Child, the longest track present and one of the best; a folky melodic beginning building to enjoyably epic power metal grandeur with softer, vocal-led and emotion-laden interludes and the most memorable chorus on the album. Some tracks are undoubtedly better than others, Candice Night (Ritchie Blackmore's wife and musical partner in Blackmore's Night) singing beautifully on the title track but being let down a little by the pop-metal direction of the song itself, which is a bit too Nightwishy at points, particularly the chorus. And even a spot from Geoff Tate can't save piano ballad Invincible, which at just around three minutes is too long; thankfully, Tate is back on the next couple of tracks and does far better, especially on The Piper at the Gates of Dawn (although mini-epic Alchemy isn't far behind). That Pink Floyd-referencing track is sadly short on psychedelic rock, but does have plenty of melody and the able vocals of Magnum's Bob Catley and Mr Big's Eric Martin, the former returning on Lavender. If you could criticise Moonglow for anything, it does suffer a little from having too many samey songs. By the time you've reached closing cover Maniac (originally by Michael Sambello from the Flashdance soundtrack) it is difficult to remember much of the past hour-plus. Yet individually and given further time and listens, the songs are more than enjoyable for themselves - some examples such as the catchy anthem Requiem for a Dream, with Helloween's Michael Kiske on guest vocals, are fantastic enough on their own that they will definitely earn the album replays just for themselves. Such is the nature of the album (and indeed the project) that the guest vocalists will always get the majority of the attention over the instrumentation, which is never less than excellent and more than suitable backing for each and every voice here. But ultimately this is a solid but unexciting album unless you're a massive fan of any of the singers, and while plenty of fun can be found it's definitely a step down from Ghostlights.